We came to Cancun after beginning our expat retirement adventures in Ecuador. Our retirement plans were in serious trouble in the U.S. I had suffered my second heart attack in 2009… and soon after I lost a good job and the health insurance that came with it. I was unemployed, uninsured, and the medical expenses were stacking up. So, we decided to take a chance and live overseas, a decision that first brought us to the small fishing and farming community of San Vicente on Ecuador’s coast, just a short distance from the Equator. We spent two great years there but, with my heart issues, we decided it would be wise to live closer to top-notch emergency medical care. Well, after living in Cancun for almost one year, I’ve come to the conclusion that it’s an international city with strong Mexican overtones. Though it retains its Mexican flavour, it’s a vibrant, modern and sophisticated city. Spanish is the official language here but many folks speak at least a little English. Diane and I do our best to speak only Spanish when we’re chatting with locals, but it’s not uncommon to receive responses in English. This part of Mexico’s Caribbean Coast is referred to as the Riviera Maya. It runs south from Cancun all along the coast to Belize, and is world-renowned for its spectacular sugar-sand beaches and warm, cobalt-blue water. You’ll find the world’s second largest reef system here; second only to the Great Barrier Reef. The reef can be seen just offshore and provides a multitude of recreational activities. Unlike much of historic Mexico, Cancun expanded from a tiny settlement in early 1970 to the city is today. It’s the second most active resort destination in Mexico, just after Acapulco, and is well served by a large international airport with service to nearly all major airports on the planet. But while Cancun is a modern city complete with large malls, hundreds of wonderful restaurants, contemporary infrastructure, great hotels and resorts, dozens of attractions, several major hospitals, and more activities than one can possibly do both day and night, there are other, less touristy options to explore. Catch one of the plentiful and cheap buses cruising all the main streets, and you’ll be away from the tourist areas in short order. There, you’ll find thousands of small, family-owned shops and restaurants, with authentic foods and crafts available for far less money than one would spend in the tourist areas. The open markets at Mercado 23 and Mercado 28 are two of our favourites, with hundreds of stalls and booths seemingly arranged as a maze that winds through several blocks. We recently watched an artisan hand-make piñatas in all shapes and sizes, applying layer upon layer of wet newspaper and glue to wire frames. Colourful fresh fruits and vegetables spill from bins and baskets, next to pail after pail filled with aromatic dried chilies. Large mesh bags of limes are everywhere—limes are as common on local tables as a shaker of salt in Western countries. Crates filled with live chickens sit surprisingly close to charcoal grills roasting not-live chickens. The wonderful aroma of fresh, hot tortillas, grilled chicken and simmering soups draw customers in for hearty and inexpensive meals. For only a few dollars, you can get three large tacos with rice and beans, sliced avocados and tomatoes. The most traditional tacos are made with cochinita, a slow-roasted pork that is of Maya origin and it is delicious! There’s a lot to explore farther down the coast, too. Along the Riviera Maya, you’ll find other big cities, such as Playa del Carmen, as well as small, quaint villages like Puerto Morelos with its famous leaning lighthouse, or the historic city of Tulum with its spectacular ruins set right on the beach. Cenotes (say-note-tays) by the hundreds dot the Yucatan’s landscape. Cenotes are underground lakes and rivers of crystal clear water, accessed by sink holes at the surface. For a small fee, there are hundreds accessible. Swimming in a sink hole filled with stalactites, peering into the clear depths below, is an unforgettable experience. 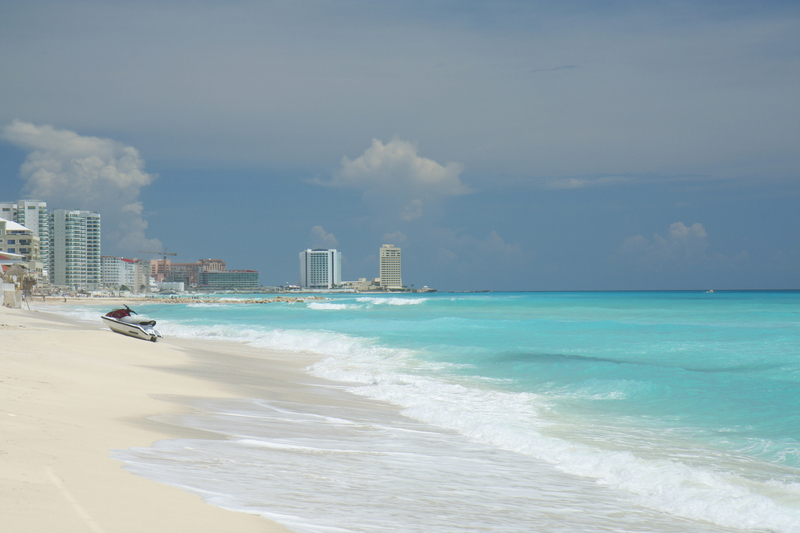 These days, when tourists ask “Why Cancun?” I don’t rush to answer. Instead I take them to a leisurely lunch with Diane and explain all of the reasons above—and many more—over cochinita tacos and guacamole with one of the local cold beers. For International Living Postcards — Australian Edition.